UPDATE: I have added screenshots from my laptop at the bottom of this post. After having purchased a second hand laptop, I immediately installed Slackware Linux 13.0 on it. I was already a fan of Slackware Linux even on its version 10.x and up where it has even a ZipSlack version where you can run Slackware from MSDOS. I installed their current Slackware 13.0 release using the DVD installer. The install process is still the same as it was before. You will be greeted with a boot prompt where you can choose (actually if you want to choose you type it) as kernel for your hardware. What has changed is that there are less kernel options to choose from. I used the default kernel. 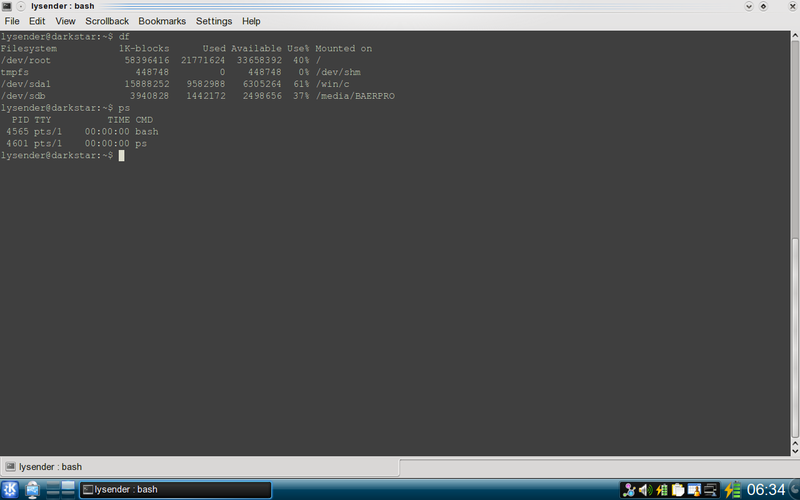 I added about 3GB of swap partition. Almost 15GB are used by my Windows XP. The rest are for Slackware. Not like the way I did before, I was not able to setup a different partition for the /boot directory. I ended up using the whole partition for the root. Anyway, I know there can be no problem with that setting. After the install process, I choose to enable other services that I will be needing for web development like HTTPD server, MySQL server, Samba and the others that I forgot already. Again as usual, LILO is the default bootloader. I don’t think I’m going to use GRUB so I leave it as is. When I reboot after a successful install, I was greeted with the default console login. I login as root and immediately started X.
KDE starts, but the graphics is garbled. It freezes after few seconds. I suspect that my graphics is not fully supported with the default installation. I even re-installed it twice but still no results. I tried to edit /ect/X11/xorg.conf, run xorgsetup, tried different window manager but still X is the problem. To the rescue is the official Slackware forum. I searched for possible solutions like editing the xorg.conf and other stuff. Then I finally came up with the solution. I downloaded the necessary files and the GIT clone repo. At home, I followed the every steps and here is the summary of what happens. Instead of using sudo, I just used su. I have copied the source from a git clone so I just to the following inside the source directory. However, the command above does not work as is because it is generic. I search the /usr/lib to find out where is that linux-core located. I found out that linux-core is the directory where your currently installed linux kernel is stored. And the LINUX_DIR is I think the same as linux-core, I forgot already. But I just did it by trial and error method. Finally It compiles for almost THREE hours! You will also need to change the cp *.ko command to the directory where the *.ko is located. Scan the linux kernel source directory to find it. I’m sorry I have not take down notes on that. After a reboot, i logged in as root and started X. I was greeted with a shiny KDE splash screen. Finally, X worked! A very had work indeed! The next step I did was to configure sound using alsaconf. 1. Run command alsaconf on runlevel 3. 2. Run command alsamixer and set the volume settings. 3. Run command alsactl store to sore your volume settings. After three days of very hard work and patience. But the price is a rock solid desktop machine. Update: Here are some screenshots from my laptop. This entry was posted in Slackware and tagged openchrome, Slackware, slackware 13, slackware 13 x, slackware 13 xorg, xorg. Bookmark the permalink. I’m thinking of giving Slackware a go after reading it, just because I want to see if that whole “use slackware – learn linux” thingy is true (as you so cunningly show us lol). The “use slackware – lean linux” will give you problem when dealing with other distros! However, that is where the fun is. If you’ll use slackware, you’ll get screwed! I promise. However, if you won’t give up on slackware, you’ll learn a lot in your system. Only if you have patience and determination. I’m already using Slackware-Current as of Jan 31 2010. By the way, the wallpapers: Just search in Google about “wonder girls wallpaper”. Of course, I can send it to you secretly if you really like.